PartPay offers an in-store process, whereby customers are able to pre-request credit, and complete the payment of the order at the point of sale, in a seamless manner. 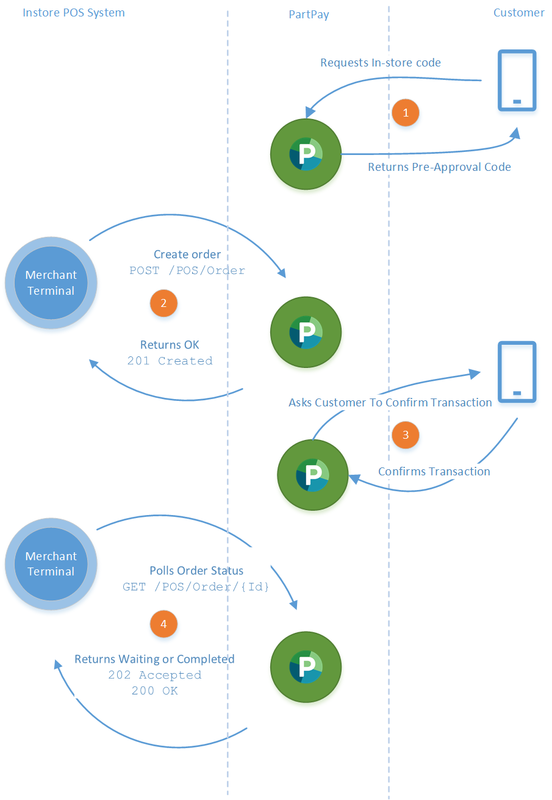 A typical in-store order flow with PartPay is a 2-step process. The customer requests a pre-approval code via their phone. The customer is presented an option to confirm or cancel the transaction on their device. The merchant terminal will poll PartPay to enquire if this order has been confirmed by the customer. See more in Order Status The below diagram shows the typical 2-step flow for a POS integration with PartPay. Authentication is one by the obtaining of a bearer token, by posting a client_id and a client_secret to the token endpoint. Given these values are particularly long and cumbersome to input to a POS terminal, we offer the ability to have an interactive enrolment process whereby a retailer is able to enrol their terminal from the Merchant Portal. To obtain a token, see authentication. Enrolment allows easy enrolment of terminal devices, which is helpful when considering long/sensitive client ID’s & secrets. Once the merchant has signed up for the In-Store api, the Point of Sale terminal can download client credentials using the enrol endpoint. Enrollment is a 2-step process initiated via the Merchant Portal. Before attempting authorization, please ensure you are logged into the Merchant Portal. Secret (min 5 characters) Click the [Add] link. This will create a short, time-limited code like A5B1D2. Any number of POS Terminals can be enrolled depending on your POS Software. PartPay can also provide you with the required client credentials should you want to deploy them in an alternate manner. The enrol endpoint is primarily a way to use a one-time code to easily download the client credentials for your Point of Sale terminal to enable it to use the In-Store Api. This has been designed for Point of Sale terminals that have limited configuration abilities.